Located on the eastern edge of the village of New Abbey stands an impressive shrine to human and divine love. 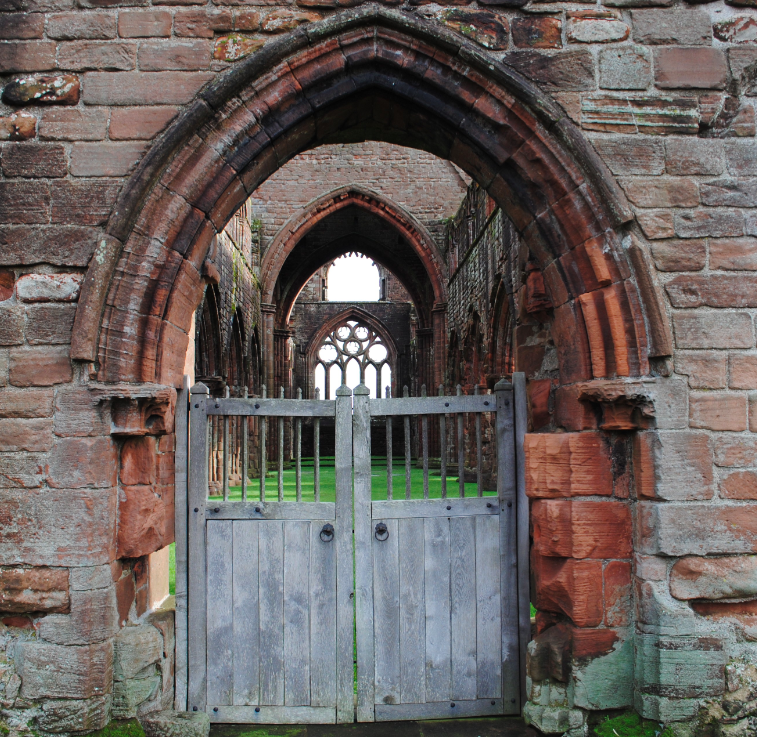 The ruin of Sweetheart Abbey sits between the grey granite bulk of Criffel and the waters of the Solway Firth. Lord John Balliol of Barnard Castle died in 1268 and his grieving widow, Lady Dervorgilla of Galloway, had his heart embalmed and put into an ivory casket. Dervorgilla undertook many charitable acts which included establishing the Cistercian abbey of Sweetheart, not far from her home at Buittle Castle. When she died in 1289 her body and her husband’s heart were buried there. 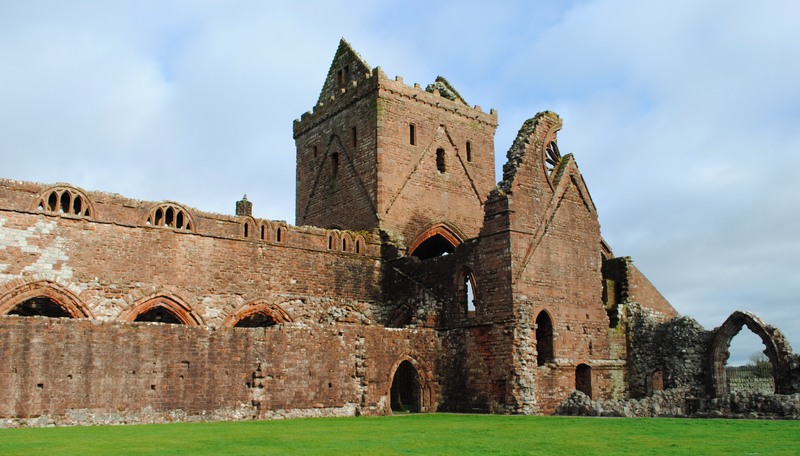 Established in 1273, the abbey was a daughter house of Dundrennan Abbey near kirkcudbright and was devoted to the worship of God. 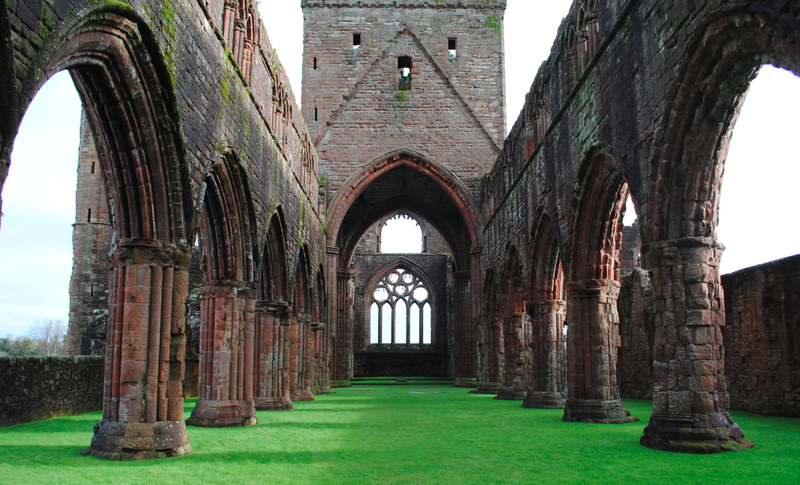 While builders were still working on the abbey church, the Wars of Independence erupted and after 50 years of bloodshed, the monastery was in a poor state of repair. The new lord of Galloway, Archibald Douglas ‘the Grim’, had the abbey repaired but thereafter little is heard of the abbey until its demise following the Protestant Reformation of 1560. Despite the prolonged wars with England, much of the abbey survives almost entire providing a lasting testament to the monastic ideal that was of such pivotal importance in the medieval age. The site of the abbey was perfect for the Cistercian way of life with shelter provided by rising ground to the west with fertile land drained into a slow winding burn, Abbey Pow, and a neighbouring loch provided water for drinking, flushing toilets and powering corn mills. A little over a mile from the abbey was a safe natural harbour for ships bringing in building materials and other provisions and carrying away the produce of the monastery’s granges (estate centres). The abbey church at Sweetheart, in common with all Cistercian churches, was dedicated to St Mary the Virgin. It was planned in the shape of a cross and divided up into different areas including the presbytery, monks’ choir, transepts and nave. A pulpitum (timber screen) to the west of the central crossing divided the long church into two with the presbytery and monks’ choir to the east and the nave to the west. The west front and upper part of the nave were only built in the later 14th century as a result of the Wars of Independence interrupting the building schedule. 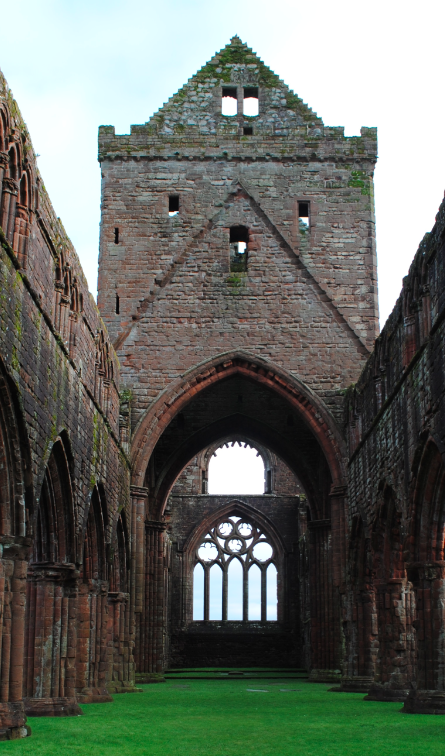 The abbey would have been designed by a master mason appointed by the abbot. The builders lived in temporary wooden huts as did the monks themselves until their new home was ready. The land was cleared of granite boulders which were used to build the precinct wall, the domestic buildings and the cores of the church walls. The red sandstone for the church and for the window and door surrounds in the cloister buildings was brought from nearby quarries. Oak for the roof and fir trees for scaffolding may have been imported by sea. Although the building has beautiful stone tracery in the windows, Cistercian austerity is evident in the planning of the building. There is no triforium and the tower over the crossing was deliberately kept low in deference to a ban in 1157 on bell towers. The battlements and gables above the tower were added much later. The stone tracery in the presbytery windows demonstrates the influence of the style of Gothic architecture which developed in France in the 1230’s. The presbytery, in the east end, was the most sacred part of the church where the high altar was situated. 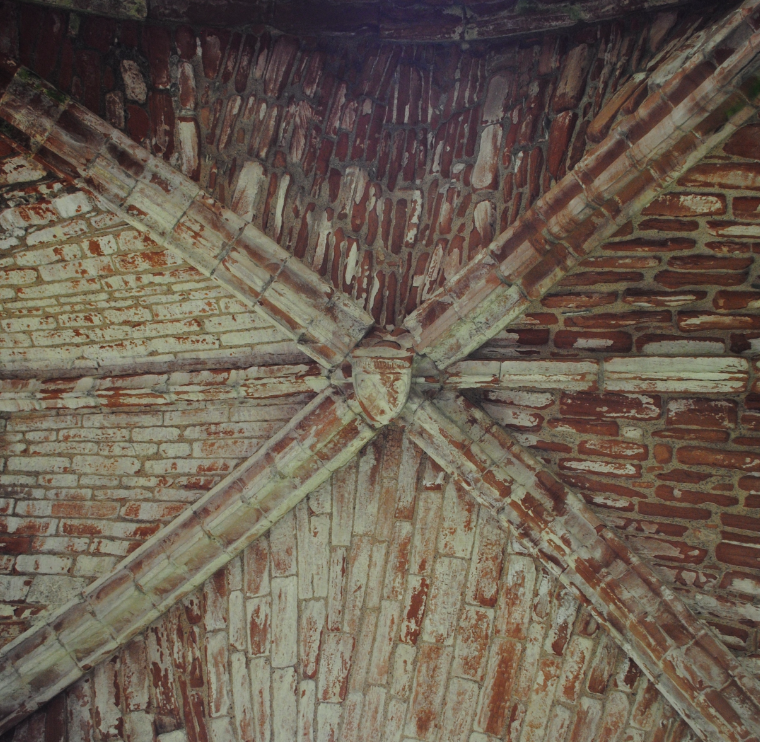 In the vaulted ceiling of the south transept chapel (above) is a stone boss bearing two croziers in saltire together with a heart and three stars (the Douglas arms). This is evidence that the abbey church was repaired by the Douglas family after the Wars of Independence. The nave is six bays long and aisled down both sides. The phased construction of the abbey church is visible not only in the clerestory, where the two eastern windows are of a different design from the other ‘eyebrow’ windows (below), but also in the arcade where the moulded capitals on top of the two eastern pillars have simple mouldings while the four western ones have carved foliage. 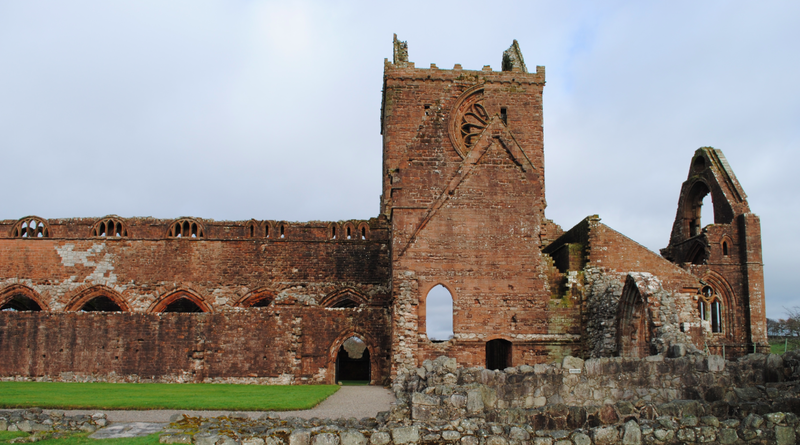 The monks who built Sweetheart Abbey were Cistercians. The order was founded in 1098 at Citeaux, near Dijon in France, by monks desiring to return to a purer observance of the monastic rule compiled by Benedict of Nursia for his monastery at Monte Cassino in Italy in around 540. The Cistercians, or ‘white monks’ as they were known from the colour of their habit, first arrived in Scotland from Rievaulx settling in Melrose in the eastern borders in 1136. 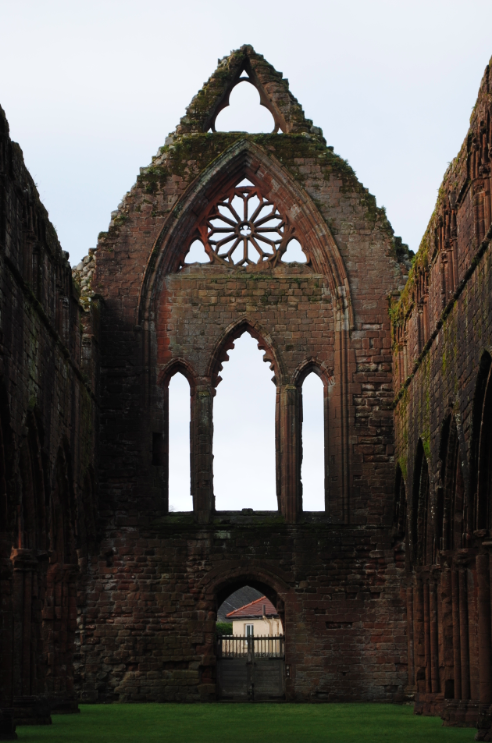 Sweetheart Abbey was the last of 12 Cistercian monasteries set up in Scotland.